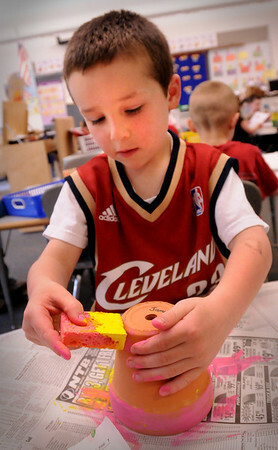 Salisbury: James Tatro, 5, uses a sponge to texture paint onto a flower pot in kindergarten class at Salisbury Elementary School on Wednesday. The children are going to also plant flowers in them to take home as a gift for Mother's Day. Bryan Eaton/Staff Photo Newburyport News Wednesday May 6, 2009.